DR Congo forward Yannick Bolasie believes his side can become unbeatable after their 4-2 win over Congo in the Africa Cup of Nations quarter-final. "We made it difficult for ourselves, they scored the first two goals. We have conceded first in every game and we have to stop that," he said. "Our strikers had plenty of chances and it's good to see them put some away. "We need to learn how to take the lead and hold it. Once we get in front I think there's no-one that can stop us." After a dour first half, the last-eight match between the Central African neighbours exploded into life after the interval. DR Congo appeared to be in serious trouble after 64 minutes, having fallen behind to goals by Ferebory Dore and Thievy Bifouma. 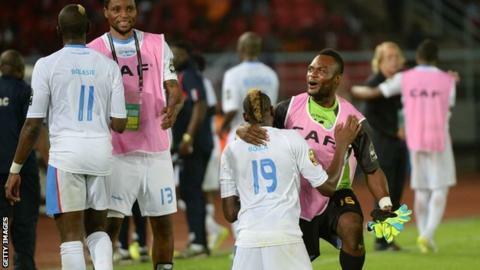 But, having already rattled the bar twice, DR Congo finally found their cutting edge and in a 16-minute spell they fought back to lead 3-2 with goals from Dieumerci Mbokani, Jeremy Bolika fand Joel Kimuaki. Mbokani struck the fourth goal to seal a remarkable victory - DR Congo's first in the competition, following three draws in the group stage, where they managed only two goals. "You saw in the second half what we are capable of," added Crystal Palace winger Bolasie. "It was a long time ago that we got to the semi-finals, so it's a big achievement. It is going to be tough but we are really looking forward to it." Congo coach Claude LeRoy described the course of the match as taking his team from "living in a dream to a nightmare a few minutes later". He was also unhappy that his side conceded a goal when they had only 10 men on the field. "The assistant referee delayed our substitution after one of my players was injured and we wanted to replace him and it was at that time that they got one of their goals," said former DR Congo boss LeRoy. "So we played 10 against 11 and that was when we conceded a goal because an official was not diligent enough. "It's football and, except for this big mistake by the assistant referee, the refereeing has been very good since the start of the competition," he added. "Probably this defeat is my biggest disappointment. When we were 2-0 up, we were not far from the dream. But we became euphoric after we scored our second goal and we also lacked a little bit of experience at this level."